First off, don’t miss this crazy cool side-by-side comparison by The Verge, who make it as easy as moving your cursor back and forth across images of iPhone 6 and Galaxy S6 to see the main aesthetic differences between the two. For one, both phones have all-around metal builds, with front and back glass (though the Galaxy S6 is armed with tougher-than-anything Gorilla Glass). The Galaxy S6 comes in just slightly thinner than the iPhone 6 at 6.8mm versus Apple’s 6.9mm. Of course, one of the most noticeable differences is the new fingerprint scanner that Samsung has mounted on their new flagship… A nod towards Apple’s iPhone 5s & all designs moving forward? The Galaxy S6 screen outsizes Apple’s iPhone 6 by 4.7″ to 5.1″, and packs in a 1440×2560 resolution compared to the iPhone 6’s 750×1334 resolution. Still, the iPhone 6 Plus beats them both with 5.5″ that boasts a 1080×1920 resolution. And these screen sizes do even more to show off the stunning photos captured by both smartphones; the iPhone 6 with 8Mp and the Galaxy S6 at 16Mp. However, the iPhone 6 has a leg up here with their new 240fps slo-mo and time-lapse capabilities. 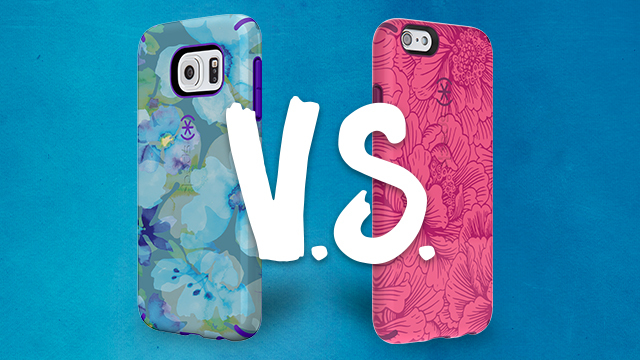 See what kind of Galaxy S6 cases and iPhone 6 cases we’ve got in store to protect whichever device you choose. Rest assured, you’ll be arming your smartphone with mighty slim, military-grade protective protection.